I didn’t grow up celebrating Pesach. But over the years, I’ve attended seders where I was inspired by the remarkable story told in the haggadah — a tale of a people who, sustained by fortitude and faith, escaped slavery and reached their freedom. The third and most important lesson of the Book of Exodus comes at the end. So that they would never again be subjugated, the Jewish people arrive to their own homeland. I’ve proudly stood with the State of Israel for my entire career, making sure it always has the resources it needs to maintain its qualitative military edge. I also worked to ensure funding for the Iron Dome missile defense system and saw its effectiveness first-hand when I worked with Prime Minister Netanyahu to negotiate a cease-fire in Gaza. Since its installation, this technology has saved countless lives. 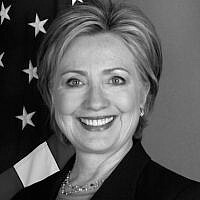 Hillary Clinton is the former US secretary of state and senator from New York and a Democratic candidate for president.